Many proteins are localized outside of the cytoplasm in both eukaryotic and prokaryotic cells. In fact, approximately 50% of an organism’s proteome is exported across or inserted into a biological membrane. Cells are therefore faced with a daunting logistical problem - getting proteins out of the cytoplasm. Typically, these are synthesized on cytoplasmic ribosomes and are transported during or after translation to their final destination. In bacteria, proteins localized outside of the cytoplasm are transported through two distinct pathways that operate in parallel. Depending on their targeting signal, these proteins are funneled into either the Sec or Tat pathway for membrane translocation. The Sec pathway is found throughout all kingdoms of life and is essential for viability. The vast majority of proteins are transferred across the plasma membrane via the Sec machinery in an unfolded state (1), while proteins that are directed into the Tat pathway are translocated in a folded state (2). The Tat system is named after the signal sequence of its substrate proteins which contains a consecutive pair of arginines (twin arginine motif). This system is found in about 80% of all sequenced bacteria as well as in many archaea, chloroplasts and some mitochondria. It plays a key role in many biochemical processes, including energy metabolism, biofilm formation, nutrient uptake, quorum sensing, resistance to heavy metals and antimicrobial peptides, virulence, cell division, cell motility and photosynthesis (2,3). Despite its widespread conservation, the Tat system is not essential for cell viability, although deletion of the Tat pathway results in severe pleiotropic effects. The number of proteins exported through the Tat system strongly depends on the organism. For example, E. coli contains 27 predicted Tat substrates, S. aureus one, while S. coelicolor contains up to 189 potential Tat substrate proteins (17% of the secretome) (3). However, in halophilic archaea the vast majority of proteins are exported Tat-dependently and it is therefore not surprising that in these organisms that the Tat system is essential for viability (4). Interestingly, the Tat system displays remarkable versatility in handling different substrate proteins. In addition to being folded and sizable, these often contain cofactors and can be part of oligomeric complexes (3). Moreover, the Tat system is able to export lipoproteins and assemble a subset of membrane proteins (5,6). The Tat-dependency of many exported cofactor-containing proteins is dictated by the incorporation of the cofactor prior to its folding in the cytoplasm. Consequently, cofactors of Tat substrate proteins are found both in cytoplasmic and exported proteins. These range from metal-sulphur clusters to nucleotide-based cofactors, while proteins exported through the Sec system contain cofactors exclusively found in the periplasm because these proteins fold after translocation in the periplasm (3). Tat-dependent membrane transfer of substrate proteins is fueled by the proton motive force (PMF) and can be blocked by PMF inhibitors (2,3). Remarkably, it has been estimated that translocation of each substrate protein by the Tat system occurs at the expense of 105 protons provided by the PMF. This equals about 104 molecules of ATP, underscoring that Tat-dependent translocation is extremely energy demanding (3). The best characterized Tat machineries are found in E. coli and chloroplasts and comprise a complex of three small membrane proteins, termed TatA, TatB and TatC. Here, I will discuss recent structural and mechanistic advances of the E. coli Tat system. 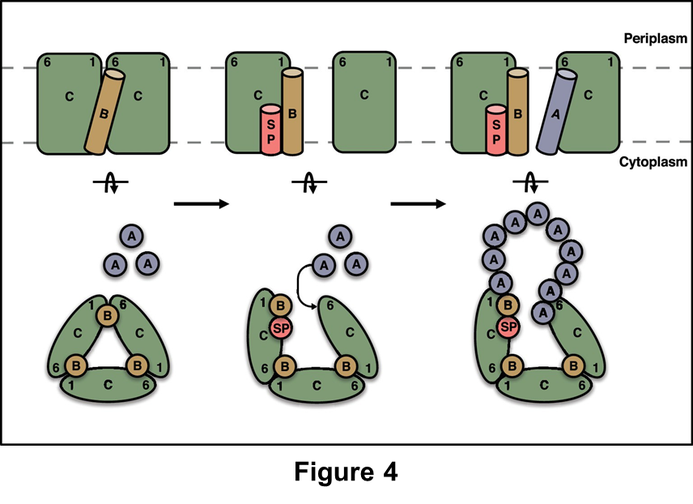 The Tat system accomplishes the remarkable feat of translocating fully folded proteins across the membrane, while simultaneously maintaining the permeability barrier (2,3). For the Sec apparatus the latter is achieved by creating a tight seal around the unfolded polypeptide in the protein-conducting channel (1). A similar mechanism of maintaining the permeability barrier for the Tat system is difficult to reconcile with its ability to translocate folded substrate proteins of up to 150 kDa (7). The Tat apparatus is, therefore, clearly unique. Hence, it is not surprising that Tat proteins are unrelated to components of other protein translocation machineries. The basic steps of Tat mediated protein export are shown in figure 1 (adopted from 2). The Tat translocation cycle is initiated by binding of the substrate protein to the TatBC receptor complex through their signal peptide (figure 1). Like most other signal peptides, Tat targeting signals are proteolytically removed after translocation and have a tripartite organization with a positively charged n region at the N-terminus, a hydrophobic h region in the middle and a polar c region at the C-terminus. The n region contains the characteristic twin-arginine motif, while the c region contains the signal peptide cleavage site (2,3). 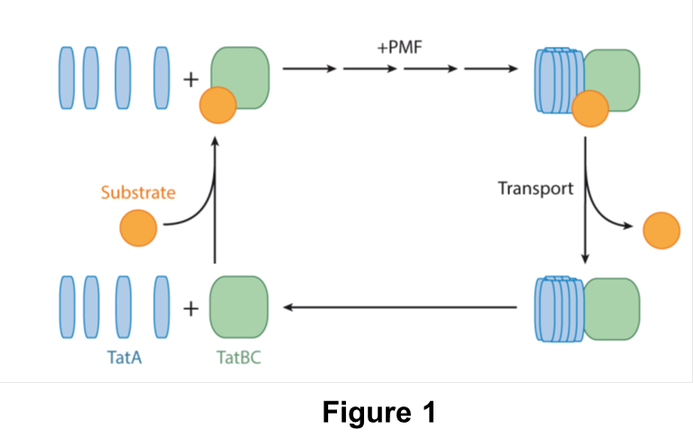 Following association of the substrate protein with the TatBC complex, TatA is recruited and polymerizes into the TatABC translocation complex. Recruitment and subsequent polymerization of TatA are PMF dependent (figure 1). It is believed that the substrate protein is transferred across the membrane via polymerized TatA. Subsequently, the signal peptide is proteolytically removed and the protein is released into the periplasm after which TatA disassociates from the translocation complex and depolymerizes (2,3). The best characterized Tat systems are found in cholorplasts and E.coli, comprising TatA, TatB and TatC. However, different Tat systems have been described in other organisms made up of only TatA and TatC. TatAC systems are prominent in Gram-positive bacteria with a low GC content in their genomes and archaea, while TatABC systems are found in Gram-negative bacteria, Gram-positive bacteria with a high GC content and plant chloroplasts (3). Moreover, additional Tat components are often present in many organisms. For example, E. coli contains TatE, which is a functional duplication of TatA (8). TatA and its paralog TatB are small membrane proteins of 10 and 18 kDa, respectively. TatA is present in molecular excess (≈ 20 fold) over TatB and TatC. Figure 2 shows the NMR structure monomeric TatA (PDB: 2MN7) and a structural model of oligomeric TatA (PDB: 2LZS), comprising nine protomers (9, 10). The structure of monomeric TatA confirms the Nout-Cin topology and reveals a single transmembrane domain (TMD) of 15 residues shown in red and a C-terminal amphipatic helix of 21 residues in magenta. 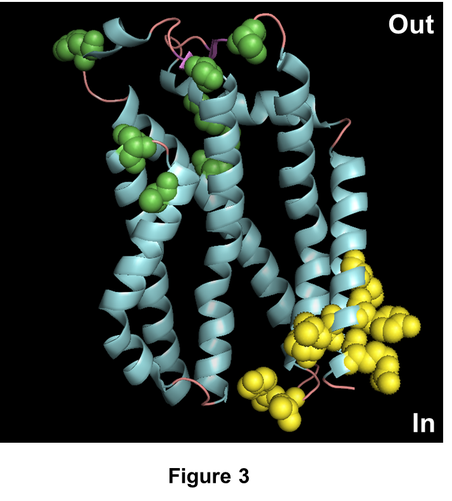 The helices are connected by a conserved linker of 4 residues and the protein adopts a L-shaped conformation. The TMD contains a highly conserved polar residue (glu, his or lys) at its N-terminal end which is essential for TatA function. Likewise, a functionally important and conserved phe is located at the C-terminal end of the amphipatic helix. The structural model of oligomeric TatA shows a ring-shaped structure with the TMDs located at the inside and the amphipatic helices at the outside of the ring. According to this model, oligomerization is mediated primarily by the TMDs and may also require the amphipatic helix. However, its role is less clear because it is not directly involved in oligomerization, although the amphipatic helix is crucial for TatA activity as substitutions in this area block Tat translocation (2, 3). Previously, ring-like structures composed of TatA ranging from 100 to 500 kDa have been observed by electron microscopy (2,3). These results are therefore consistent with the structural model of oligomeric TatA. Based on molecular dynamics studies it was suggested that TatA does not form a translocation pore – rather, it was proposed that a substrate protein contacts the amphipatic helix and is subsequently pulled into the pore. This forces the subunits apart which results in locally thinning and rupture of the membrane, enabling protein translocation and at the same time disassembly of the TatA oligomer (10). The NMR structure of monomeric TatB (PDB: 2MI2) was solved recently (12) and is shown in figure 2 (bottom panel). Like TatA, it has a Nout-Cin topology with a single TMD of 12 residues (in red) and a amphipatic helix of 20 residues (blue). Genetic studies have shown that the short N-terminal tail, which precedes the TMD is of functional importance (2,3 ). Additional helices are present in the C-terminal region, termed α3 of 15 residues (orange) and α4 of 19 residues (magenta). The role of α3 and α4 is not well understood but it has been suggested that these helices are involved in binding of substrate proteins. Overall, TatB adopts an extended L-shaped conformation with a relatively rigid TMD and amphipatic helix, while α3 and α4 show higher flexibility. All helices are connected by short, flexible linkers. TatC is a polytopic membrane protein and is with a mass of 29 kDa the largest component of the membrane-embedded Tat subunits. Moreover, it displays a high degree of conservation and functions as the initial binding site for signal sequences of Tat substrate proteins prior to assembly of the translocation complex. Recently, the crystal structure of TatC from Aquifex aeolicus was solved in two independent studies (13, 14). The structure of TatC is shown in figure 3 and reveals that a protein has a Nint-Cin topology with six TMDs (in blue). These are connected by short loops at the cytoplasmic face of the membrane, while in the periplasm the loops between the TMDs are longer. Overall, TatC adopts a glove-shaped structure in which the kinked TMDs form a membrane-embedded pocket overhung by the periplasmic cap. Moreover, TatC has a unique structure which is not related to the structure of the Sec machinery (13,14), which also translocates signal peptide-bearing substrate proteins across the membrane. Twin arginine translocation is driven by the PMF, although the structure of TatC does not include any obvious channel or other pathway for the transmembrane passage of protons. Interestingly, TatC contains two patches of conserved residues at the periplasmic (in green) and cytoplasmic (in yellow) side, respectively. Biochemical evidence has implicated the patch localized at cytoplasmic side in signal peptide binding, while the periplasmic path serves as potential contact site for other components of the Tat system (13, 14). With regards to the latter, it should be noted that TatC does not function alone. It has been established that in E. coli TatC forms a stable complex with TatB with a size of 360-700 kDa and probably containing eight copies of either protein (2, 3). Within this complex, TatB protects signal peptides from premature cleavage (15). Evidence obtained from mutagenesis and photocrosslinking experiments established the periplasmic patch as contact site between TatB and TatC. Likewise, TatA also interacts with TatC in this region as evidenced by photocrosslinking experiments. Despite the structural information of the individual Tat components, the structure of the Tat holocomplex has not been solved so far. This is in part because of the dynamic and transient interactions between the Tat components, preventing the collection of suitable samples. Therefore, alternative methods are required to obtain structural insight of the holocomplex. Recently, a complementary approach of computational analysis, simulation and experimentation was used to probe molecular interactions between TatA, TatB and TatC (16). This study confirmed that TatA and TatB share the periplasmic patch of TatC as binding site. TatC is bound to TatB in the resting state, while TatB is replaced by TatA following the binding of a substrate protein. Based on these results a model for substrate-dependent activation of the Tat receptor complex and subsequent formation of the translocation complex was proposed (16). This model is shown in figure 4 (adopted from 16) and starts with the TatBC receptor complex in the resting state. Signal peptide (SP) binding to TatC (green) induces a conformational change, resulting in a decreased affinity for TatB (orange). This promotes the association with TatA (blue) and replacement of TatB. 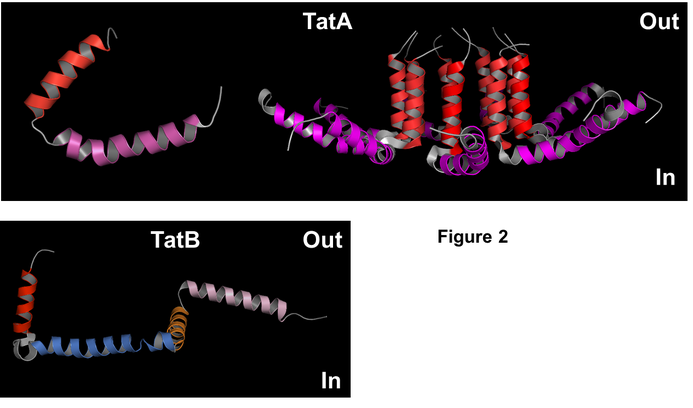 Conceivably, the initial binding of TatA triggers its polymerization resulting in the TatABC translocation complex. The Tat system is found in the chloroplast thylakoid membrane, the cytoplasmic membrane of bacteria and archaea as well as the inner membrane of some mitochondria. This system is probably best known for its ability to translocate fully folded and often cofactor-containing substrate proteins across the membrane. The best characterized Tat systems are found in chloroplasts and E. coli. Research on these systems has shown that only three membrane proteins (TatA, TatB and TatC) are required for translocation activity. Of these, TatB and C form a dimeric complex required for the initial binding of a substrate protein. Subsequently, TatA is recruited and polymerizes into the TatABC translocation complex. Moreover, twin arginine translocation is not powered by nucleotide hydrolysis but solely by the PMF which is made up of the pH gradient and electric potential. Studies with an in vitro reconstituted chloroplast translocation system indicated that Tat transport only requires the pH gradient, while in vivo studies suggested that the electric potential powers twin arginine translocation (17,18). By employing a translocation system reconstituted with purified E. coli components, PMF dependency of bacterial Tat transport was assessed (19). This showed that Tat transport is pH independent, while the electric potential drives two steps of the translocation process. Although the initial binding of substrate proteins does not require the PMF, TatA oligomerization is PMF dependent. It is at yet not clear what other step in E. coli requires the PMF. The contrasting data obtained with different biological systems shows that the precise role of the PMF in twin arginine translocation is poorly understood. Although the Tat system is in general not essential for viability, accumulating evidence shows that it plays a key role in many biochemical processes, ranging from energy metabolism to nutrient uptake and virulence. With respect to the latter is has been established that twin arginine translocation is utilized by many human bacterial pathogens, including S. aureus, P. aeruginosa, M. tuberculosis and H. pylori, to secrete proteins that contribute to pathogenesis (20). Therefore, the Tat system comprises a potential antimicrobial drug target. The unique ability of the Tat system to translocate fully folded and cofactor-containing proteins can also be utilized for biotechnological purposes. For example, several studies showed that heterologously expressed enzymes can be exported Tat-dependently to the E. coli periplasm by fusing it with a native Tat signal sequence, enabling their use in whole-cell biocatalysis and library screening (21,22). A detailed molecular and mechanistic understanding of the Tat system is of crucial importance to fully exploit its potential as antimicrobial drug target and to harness its power for biotechnological applications. 1. Tsirigotaki A, De Geyter J, Šoštaric N, Economou A, Karamanou S. (2017). Protein export through the bacterial Sec pathway. Nat Rev Microbiol. 1 pp: 21-36. 2. Berks BC. 2015. The twin-arginine protein translocation pathway. Annu Rev Biochem. 84 pp: 843-864. 3. Palmer T, Berks BC. 2012. The twin-arginine translocation (Tat) protein export pathway. Nat Rev Microbiol. 10 pp: 483-496. 4. Hutcheon GW, Bolhuis A. 2003. The archaeal twin-arginine translocation pathway. Biochem Soc Trans. 3 pp: 686-689. 5. Shruthi H1, Babu MM, Sankaran K. 2010. TAT-pathway-dependent lipoproteins as a niche-based adaptation in prokaryotes. J Mol Evol. 70 pp: 359-370. 6. Hatzixanthis K1, Palmer T, Sargent F. 2003. A subset of bacterial inner membrane proteins integrated by the twin-arginine translocase. Mol Microbiol. 49 pp: 1377-1390. 7. Widdick DA, Dilks K, Chandra G, Bottrill A, Naldrett M, Pohlschröder M, Palmer T. 2006. The twin-arginine translocation pathway is a major route of protein export in Streptomyces coelicolor. Proc Natl Acad Sci U S A. 103 pp: 17927-17932. 8. Eimer E, Fröbel J, Blümmel AS, Müller M. 2015. TatE as a Regular Constituent of Bacterial Twin-arginine Protein Translocases. J Biol Chem. 290 pp: 29281-29289. 9. Zhang Y, Hu Y, Li H, Jin C. 2014. Structural basis for TatA oligomerization: an NMR study of Escherichia coli TatA dimeric structure. PLoS One. 9: e103157. 10. Rodriguez F, Rouse SL, Tait CE, Harmer J, De Riso A, Timmel CR, Sansom MS, Berks BC, Schnell 11. JR. 2013. Structural model for the protein-translocating element of the twin-arginine transport system. Proc Natl Acad Sci U S A. 110: E1092-101. 12.Zhang Y, Wang L, Hu Y, Jin C. 2014. Solution structure of the TatB component of the twin-arginine translocation system. Biochim Biophys Acta. 18380 pp:1881-1888. 13. Ramasamy S, Abrol R, Suloway CJ, Clemons WM Jr. 2013. The glove-like structure of the conserved membrane protein TatC provides insight into signal sequence recognition in twin-arginine translocation. Structure. 21 pp: 777-788. 14. Rollauer SE1, Tarry MJ, Graham JE, Jääskeläinen M, Jäger F, Johnson S, Krehenbrink M, Liu SM, Lukey MJ, Marcoux J, McDowell MA, Rodriguez F, Roversi P, Stansfeld PJ, Robinson CV, Sansom MS, Palmer T, Högbom M, Berks BC, Lea SM. 2012. Structure of the TatC core of the twin-arginine protein transport system. Nature. 492 pp: 210-214. 15. Fröbel J, Rose P, Lausberg F, Blümmel AS, Freudl R, Müller M. 2012. Transmembrane insertion of twin-arginine signal peptides is driven by TatC and regulated by TatB. Nat Commun. 3: 1311. 16. Alcock F, Stansfeld PJ, Basit H, Habersetzer J, Baker MA, Palmer T, Wallace MI, Berks BC. 2016. Assembling the Tat protein translocase. Elife. 5: pii: e20718. 17. Mould RM, Robinson C. 1991. A proton gradient is required for the transport of two lumenal oxygen-evolving proteins across the thylakoid membrane. J Biol Chem. 266 pp: 12189-12193. 18. Alder NN, Theg SM. 2003. Energetics of protein transport across biological membranes. a study of the thylakoid DeltapH-dependent/cpTat pathway. Cell. 112 pp: 231-242. 19. Bageshwar UK, Musser SM. 2007. Two electrical potential-dependent steps are required for transport by the Escherichia coli Tat machinery. J Cell Biol. 179 pp: 87-99. 20. De Buck E, Lammertyn E, Anné J. 2008. The importance of the twin-arginine translocation pathway for bacterial virulence. Trends Microbiol. 16 pp: 442-453. 21. Dudek HM, Popken P, van Bloois E, Duetz WA, Fraaije MW. 2013. A generic, whole-cell-based screening method for Baeyer-Villiger monooxygenases. J Biomol Screen. 18 pp: 678-687. 22. van Bloois E, Winter RT, Janssen DB, Fraaije MW. 2009. Export of functional Streptomyces coelicolor alditol oxidase to the periplasm or cell surface of Escherichia coli and its application in whole-cell biocatalysis. Appl Microbiol Biotechnol. 83 pp: 679-687.